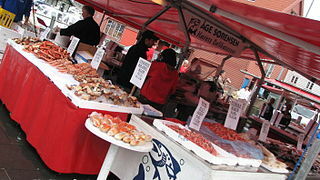 Pride Bergen fish market is now often gets a lot of negative criticism from the travelers or residents Bergen. Torget Fish Market used to sell a variety of fresh seafood brought directly by the fishermen. But now the place is nothing more than a tourist trap area. Selling fish market concept with high historical value and a highlight of the tourism Bergen, then there few tourists who come to Torget Fish Market, hopes to taste the fresh fish products Bergen with high quality. Unfortunately the fish products that are sold today poor quality, not fresh, and expensive. Additionally, Torget Fish Market more dominated by cheap souvenir stalls and reduce the original meaning Torget Fish Market at the beginning of the triumph of the market. Travelers have heard bad stories about Torget Fish Market before and do not expect much from this place. but if you are in Bergen and Torget Fish Market right in the centrum, why not stop by there? By noon Torget Fish Market was packed with shoppers, travelers who arguably see and take photos with their sophisticated cameras. You will see some frozen food with the main ingredient of seafood, prices range from quite expensive to very expensive. For example, the price of shrimp burger contents or pieces of fresh salmon ranging from 35 NOK, while a large plate containing a variety of seafood such as shrimp, salmon, and other fish with salad and serve can be sold at a price of up to 250 NOK. Although Torget Fish Market gets a lot of negative reviews, maybe you can still happy to be found here. Indeed, visitors who dominate are almost no tourists and local people who shop here, the price of food is relatively expensive, and flower and fruit sellers promised to enliven the market only seen a few, souvenir sellers even more dominant in this place. despite the existence of souvenir sellers duhina for selling poor-quality goods, you should be grateful because they enliven Torget Fish Market. If not, where else you can get souvenirs at low prices. At Torget Fish Market also you can meet the famous Norwegian salmon, meaty fish cutlet expensive orange tourists appear before bragging. When leaving the salmon fat and take photographs of some stalls selling caviar, a kiosk with a friendly offer tourists to taste the caviar being sold. The orange color of red caviar with fish aroma, with no sure end caviar some visitors to enter into the waiting mouth and taste sensations caused. Instantly unpleasant aroma directly attacking the mouth and nose. Caviar taste really weird. you need to smile politely to the kiosk and say thank you.